So here’s the weekly stats. I beat the mileage and ride totals, however missing out on the time. February 16th 2015 until 22nd 83.7 miles total in 7 hours 47 minutes. Not to worry however, it’s all good. So, my previous best Weekly mileage was December of last year. That was 65 miles in 6.94 hours over 6 rides. 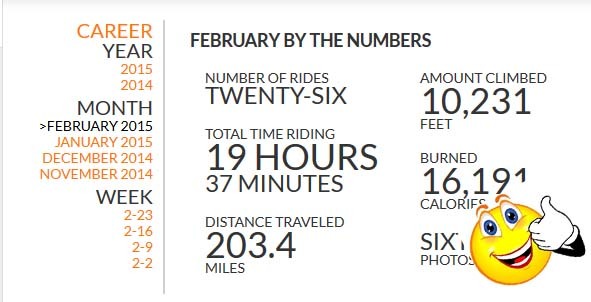 It does not look like I will be beating that record this February, with, so far 63.61 miles logged in 5 hours 55 minutes over 6 rides. Its certainly close, but I don’t think I’ll be seeing Decembers weekly mileage fall just yet. September was my previous best month for mileage, and it does look like I might be beating that however. September 2014 saw me do 40 rides in total, for a combined mileage of 157, over 15 hours and 45 minutes. February 2015 has so far got 18 rides and 151.4 over 14 hours and 25 minutes. That one is as well, close but can certainly be beaten yet. I’ve certainly beat it based on distance and number of rides, but the time isn’t looking like it will be bettered. We shall see what happens. But what ever happens, I’m lapping everyone that’s just sat there on the couch.. So I picked my bike up from VeloHeads after its service, and it feels great. Just like a new bike. On the 2.8 mile trip back from the shop to Work, the bike felt good. A few days later, I decided to head out on a long ride, 21 miles it worked out to be. This route, I have called the Duck, as it somewhat looks like a sort of running duck thing. It’s a good route, and I enjoy it. It has a good number of hills, which for me, are enough of a test of the legs, as well as a good portion of fast downhill sections. Its a route I’ve ridden alot over the last few days. Two parts of this route however, do occur on fast roads, albeit short amounts, but they are fast, and often used by HGV’s. Ripon Road is the shortest, but worst. Traffic hurtling past at 60mph, luckily its a wide road up until your right turn onto Nidd Lane. Then its minimal traffic all the way back to the Ripley road. A nice fast downhill section here through Brearton, Then its back onto quiet roads through Scotton, and another fast down hill, before opening up on the Farnham straight, a flat section where a good cadence can see your speed keep high. Finally head into Knaresborough and then back via the Beryl Burton Cycleway. I however try to avoid the Bilton lane section, as it is nothing more than a rough muddy collection of exposed brick and potholes. Something really needs to be done about this section. Its supposed to be a cycle route into Knaresborough, but it just lies there forgotten about. I had been noticing some issues with the bike lately, namely the headset was feeling really rough, and a little play in the gearing. Nothing too major, and to be expected with the hard work its done. Its still on the original parts, so I’m surprised they lasted this long. I’m hoping, when I get it back, it’ll feel like a new bike after the TLC given to it..
Well, thats January done and dusted. Only 18 rides, Just over 12 hours and 128 miles covered. It could of been better, there where days where I could of ridden more, and days where I could of ridden but did’nt. However, I have conquered a few goals in January, a few hills that used to scare me have been climbed, a new distance record set, and a general feeling of health improving, almost on a daily basis. And of course, my new favourite route to ride. So it wasn’t all bad.. But I think my bike could do with a bit of TLC, so I’m going to book it into the excellent VeloHeads, and have it serviced.